Louis Hatchett’s biography of Duncan Hines, reviewed. And the cake-mix magnate was kind of a jerk. 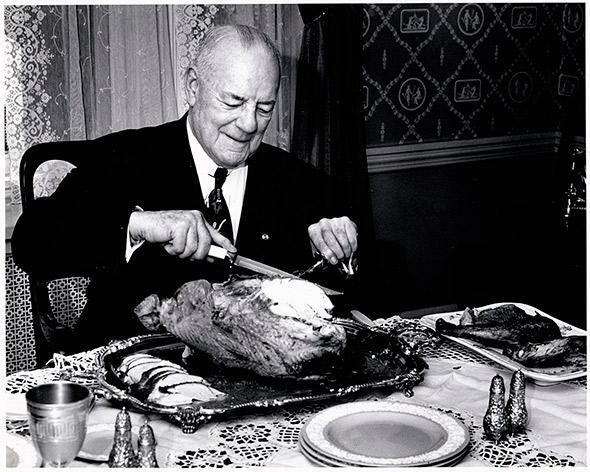 Duncan Hines carving a turkey, 1953. The newly published biography, which painstakingly traces Hines’ journey from renowned restaurant critic to cake-mix spokesman, is in fact a repackaging of Hatchett’s out-of-print 2001 book, which had the arguably pithier subtitle The Man Behind the Cake Mix. The timing of the new edition’s appearance is apt: The prospective book purchasers of 2014 include a fresh batch of millennials who are both intensely interested in food and ignorant of the fact that Hines was a real guy, renowned in his heyday not for canned frosting but for his best-selling, frequently updated, self-published guides to American restaurants and inns. There is something uncannily contemporary about Hines’ career trajectory: Although Hines’ books were a massive success in the 1930s, ’40s, and ’50s, it’s easy to imagine that he’d fare even better in the Internet age. His writing was chatty, self-important, and marketing-friendly. If he lived today, Duncan Hines would be the world’s most famous food blogger. Alas, Hines came of age a century too early to earn a cult following online. He was born in 1880 in Bowling Green, Kentucky, the youngest child of a former Confederate soldier. Hines’ mother died when Hines was 4, and his father shipped him and one of his brothers off to live with his maternal grandmother, who raised them on “apple pie, pecan pie, … country ham, candied yams, turnip greens with fatback, beaten biscuits and cornbread,” as Hines later reminisced. As a young adult, Hines headed out West to work for Wells Fargo and the Green Copper Company for a few years before settling down with his first wife, Florence, in Chicago. As a traveling salesman for a direct mail advertising firm, Hines began taking notes about the best places to eat across America; his search for decent restaurants soon became an all-consuming hobby. As Hines found himself inundated with requests for recommendations from friends and acquaintances, he decided to publish a pamphlet of his endorsements, which was so popular it morphed into a book, Adventures in Good Eating, in 1936, which soon spawned other books about cooking, eating, and traveling. All in all, Hines sold almost 2 million books between 1936 and 1947, and became so famous that in 1948 he had better name recognition than the vice president of the United States. This is why food manufacturers clamored to get Hines’ name on their products, and eventually succeeded. In short, Duncan Hines was, objectively speaking, a big deal: one of the country’s first food celebrities, beloved by millions. “Americans regarded his every word with the highest esteem,” writes Hatchett. Hatchett regards Hines’ every word with the highest esteem, too—but that makes the book a little weird, because Duncan Hines sounds like—how to put this?—a domineering, narcissistic jerk. Worse, to my mind, Hines was a total snob. “Hines had no patience with people who had failed in life,” write Hatchett. After his first book was published in 1936, he surrounded himself with those he deemed “successful people.” “In Hines’s day, people from this social strata tended to travel frequently enough to experience ‘adventures in good eating’; hoi polloi did not. People who had succeeded in life, Hines felt, could be trusted; they had competently managed their careers and finances to the point where they were considered honorable members of society.” This was a remarkably callous view to hold during the Great Depression. Hatchett isn’t the first biographer to revere his subject. But at times in this book, he seems less like Hines’ biographer writing in the 21st century and more like his PR man pushing a story to 1930s rubes. Hines was beloved by the public, Hatchett writes, because he refused to accept remuneration for his endorsements: “One restaurant offered Hines $10,000 for an advertisement; Hines refused, ‘preferring to keep his book uninfluenced by any commercial considerations.’ ” But what’s fascinating is that Hatchett maintains his reverence for Duncan Hines’ clean hands even as his own thorough research reveals that, by contemporary standards, Hines’ hands had an awful lot of dirt on them. (Or was that frosting?) He charged money for the restaurants he endorsed to display a “Duncan Hines Seal of Approval,” and, since the profit margins on his guidebooks were so low, he made most of his income this way (until he began shilling for cake mixes). “His sign rental business translated into an annual profit of almost $38,000 a year,” writes Hatchett, in an era when the average U.S. income was about $3,000. Hines also openly expected the restaurants in the “Duncan Hines Family” to sell his books to their customers, and he complained that those that didn’t “were nothing but ingrates.” Most ostentatiously, Hines accepted a Cadillac convertible as a birthday gift from the “Duncan Hines Family” restaurateurs. That these quid pro quo arrangements—in which Hines got most of his money, plus some sweet swag, from the very people he was endorsing—might constitute a conflict of interest never seems to cross Hatchett’s mind. “The man who said ‘Every man has his price’ never met Duncan Hines,” writes Hatchett at the beginning of the book. As I read about Hines’ deal with ad exec Roy Park to put his name and photo on grocery items (including the enduring cake mix), I kept turning back to that page to confirm I’d really read those words. Park went on to sell Duncan Hines–branded jam, pickles, mushrooms, sherbet, salad dressing, ketchup, Worcestershire sauce, bread, pancake mix, ice cream, cooking ranges, and coffee makers. By 1955, Duncan Hines products were bringing in $50 million (about $441 million in today’s dollars), with Hines earning royalties from each sale. Clearly, Hines had his price. It’s not that I think Hines did the wrong thing by selling out. (Who among us wouldn’t take a cut of that $50 mil?) It’s just that there was clearly some tension between his vaunted objectivity and his business agreements. Instead of exploring that tension, Hatchett presents Hines’ personal mythology to modern readers who are long past accepting midcentury heroism at face value. It’s easy to imagine a modern-day Duncan Hines launching a food blog chronicling his search for hidden meccas of regional cooking across the country, but it’s hard to imagine Hines launching a successful cake-mix brand today. In the mid-20th century, there was no obvious contradiction between Hines’ role as a booster for local, independent restaurants and his role as a spokesman for processed grocery store fare. Today, Hines would have to pick one role or the other: champion of the little guy or Big Food apologist? This odd but interesting biography makes it clear that Duncan Hines made a career out of having it both ways. Duncan Hines: How a Traveling Salesman Became the Most Trusted Name in Food by Louis Hatchett. The University Press of Kentucky.